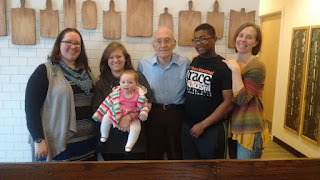 My dad is turning 80 tomorrow, so this past weekend my sisters, some of my kids, and I went down to his place for a weekend-long celebration. 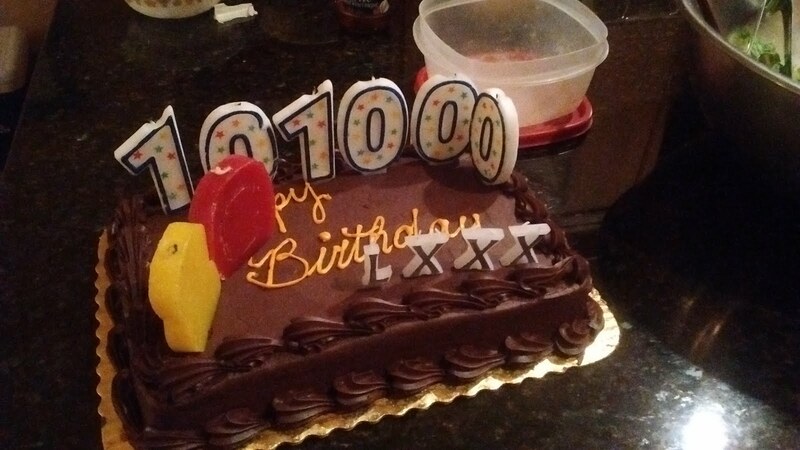 My dad is a retired physicist, and my sisters and I all went into math/science careers, so his birthday cake was truly wonderfully geeky, with his age in binary, in hindu-arabic numerals, and in roman numerals. 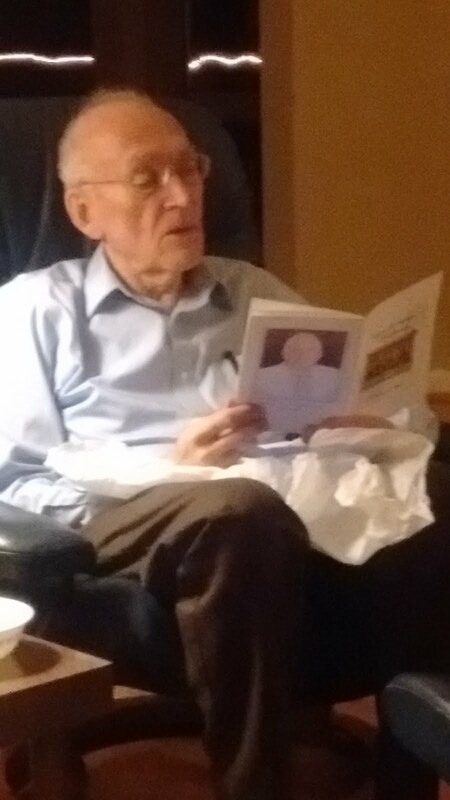 Dad loved it. (One of my sisters mock-complained that we left off the hexadecimal). Eighty: "101000", "80", and "LXXX". But of of course. What do you give your eighty-year-old father (or grandfather) for his birthday? Especially when you know he's trying to down-size his possessions? I totally love what we decided to do, with huge props to K-daughter for suggesting the idea. Here's my sister, loaning Dad a small voice recorder and showing him how to use it. 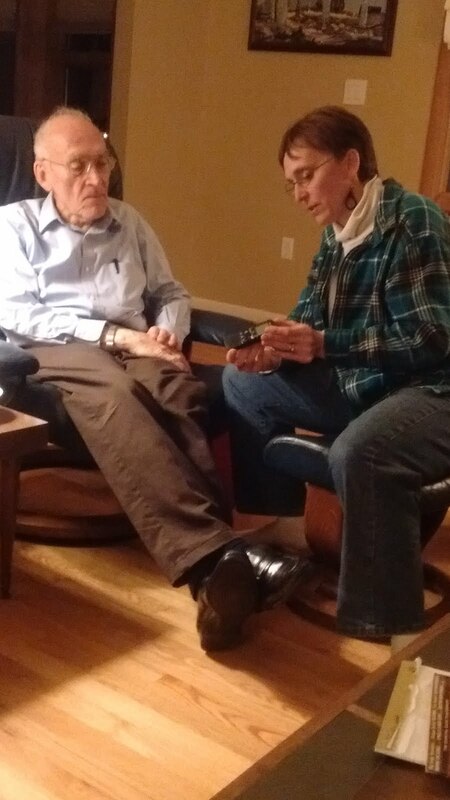 And together with the recorder, we gave him a little booklet of pictures of him, and also of us, but more importantly, of questions. 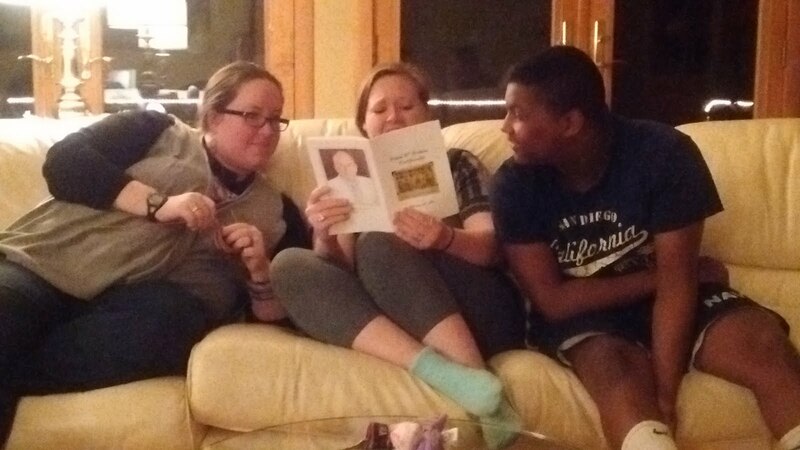 Everybody in the family asked a question or two for the booklet, and seeing the questions we came up with was so much fun. Some of us asked to hear our favorite stories again, others asked questions about things that we thought would have really interesting answers. The questions we asked, it turned out, said a lot about us! The grandkids check out the questions that other relatives asked. I really love a couple of stories that I've heard a few times, but would you tell them again? And now it's Dad's turn. He gets to tell us stories and answers. They'll make it onto a recording that'll go onto CDs and MP3s, and we'll get to hear these stories at our leisure. 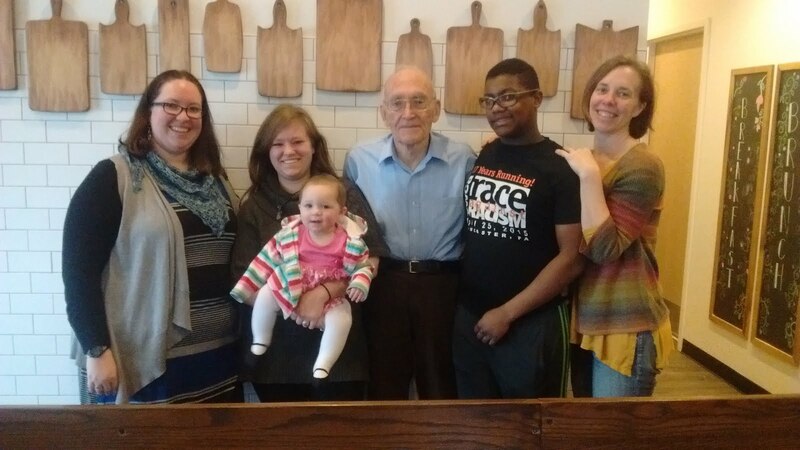 Four generations: three of my kids, my dad, my granddaughter, and me! Thanks! When we decided to do this, I figured it would be something my dad would like -- it shows we actually listened to what he said in the past, and that we actually want to hear more. That always feels good! What I didn't realize is how much the rest of us would appreciate seeing the questions other family members asked. It has been a great bonding/conversation experience all around! Out with the goat; in with the monkey!